It is not only sports teams that are ranked in league tables. Take the example of the PISA Global Education Tables, which compare different countries’ school systems in mathematics. A change in league table position between 2003 and 2013 was strongly negatively correlated with initial position, meaning that countries at the top tended to go down, and those at the bottom tended to go up. The correlation was -0.60, and some theory shows that if the rankings were complete chance and all that was operating were regression-to-the-mean, the correlation would be expected to be -0.71, not very different from what was observed. 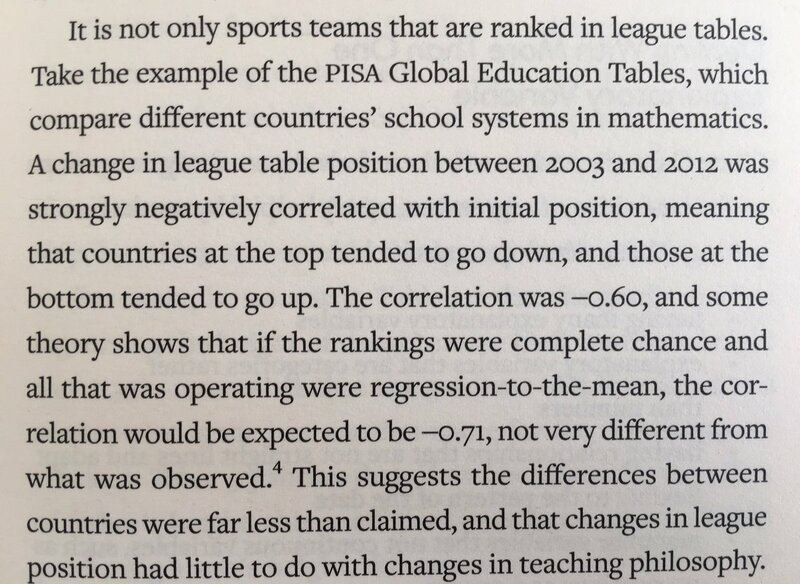 This suggest the differences between countries were far less than claimed, and that change in league position had little do with changes in teaching philosophy.